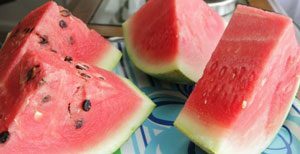 Seedless Watermelon - What About Watermelon? Although they share many similar features as the seeded variety of watermelon, seedless watermelons are infertile (unable to reproduce itself) due to the way in which they have been genetically formed using two plants that have incompatible chromosomes. This means that each individual seedless watermelon must ironically be grown from their own individual seed. This process can be timely and costly for the farmer which reflects on the purchase price of a seedless watermelon. 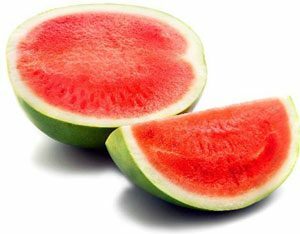 Seedless watermelons are known as hybrids (something derived by combining two different elements) due to the way they are produced. Many people believe that seedless watermelons have been genetically modified but this is not the case. Read ‘The Truth About Seedless Watermelons’. It is a complex process that takes place when farming seedless watermelons due to their infertility. Seedless watermelons are known as a triploid because instead of having twenty two chromosomes like the seeded variety they have thirty three chromosomes. As you can see this process is complex and is best taken out by a scientist. Not only are these seeds complex to create but when sowing these seeds they also need to be placed in soil at a minimum of 70 degrees Fahrenheit (21 degrees Celsius) and have a greater success rate when grown in a greenhouse. 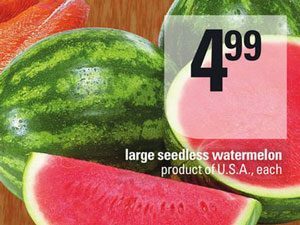 Cost associated with seedless watermelons.